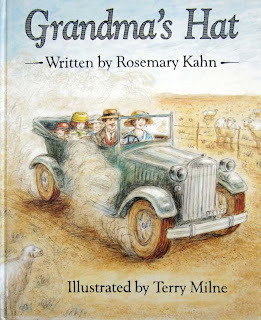 We recently discovered another review of Grandma's Hat by Rosemary Kahn. This was the first children's picture book that Rosemary (R.A.) Kahn had published. It was very well received and was printed twice in 3 different countries. If you have read the book and enjoyed it, please send in your comment or post it on the bottom of this post. Your response could assist us to motivate for a 3rd printing. In a book from South Africa, Grandma tells a favorite story about her childhood, when hats were obligatory on Sunday. Her mother had bought a her particularly ugly hat--''it looked just like a potty turned upside down'' and was ``a horrible yellowy- mustard color.'' Fortunately, the family car was a convertible, and Grandma managed to let the hated hat blow away. Her mama was upset, but Papa proved to be silently sympathetic. Later, after the hat was rediscovered on a friend's scarecrow, the whole family joined in the merriment when Papa said, ``no bird would dare come near that dreadful hat!'' It's good to have such a warm family story from a country whose books are rarely represented here. In soft pencil and watercolor, Milne's art nicely evokes the setting in its many details, including Papa's general store (where the book's one black, a wistful-looking child, is seen from the back) and the flat, dusty landscape and utilitarian homes of the Karoo. (Picture book. 3-8)"
The review lists the book as being published by Viking, actually it was published by Songololo books in South Africa, Walker books in UK and Viking Kestrel in USA.